Most athletes don’t just want to perform well, they want to look the part as well. Since many baseball players see the pros wearing compression gear, athletes at lower levels have been sporting compression garments as well. While undershirts and sleeves are stylish (they come in a number of colorways to match various uniforms), many people aren’t familiar with the actual benefits. Here’s how compression gear can help you on the field. The 2014 US Open starts today. One of the major stories prior to the start of the tournament is that Rafael Nadal is sitting this one out due to injury. At only 28, Nadal has already won 14 Grand Slam singles titles but his aggressive playing style has taken a toll on his body. Nadal has suffered from many different injuries — mostly to his knee and wrist — over his career; this is the fifth tournament in his career where he has been sidelined due to injury. It leads many to wonder if Nadal would be the greatest tennis player of all time if he could only get his body to cooperate. Whether you are a professional tennis player or you play for fun, injuries can always occur and ruin your game. In honor of the US Open, let’s take a closer look at tennis injuries and how they can be prevented. Overuse is the most common reason for tennis related injuries. Approximately two-thirds of all tennis injuries occur because of overuse. The other third is due to sudden injury or an acute event. You know an injury is common when it is named after the sport where it frequently occurs. Lateral epicondylitis or tennis elbow, is a strain of the muscles and tendons in the elbow through repetitive motions. Tennis players can get tennis elbow by practicing their backhand swing repeatedly. Swinging a tennis racket and firing off a powerful shot can put a great deal of stress on your shoulders. 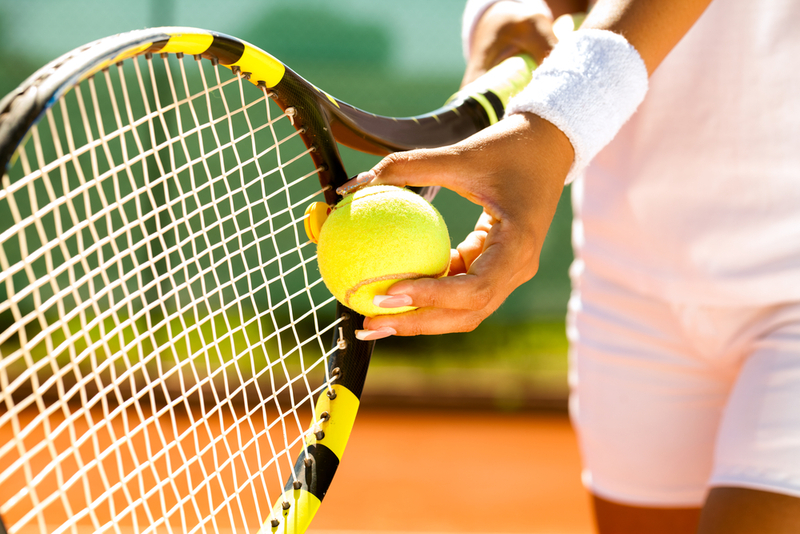 Tennis players often suffer from shoulder injuries. Rotator cuff injuries are common. The rotator cuff helps position your shoulder in the socket. If you have a weak rotator cuff, it can cause irritation in the socket tissues as it moves around. This can lead to inflammation in the tendon or the bursa (Shoulder Bursitis), causing pain when you swing your racket overhead. Tennis is a full body workout and players must sprint from one side of the court to the other. The sudden pivot as a player takes off can put stress on the knee joints, tendons and ligaments resulting in knee injuries. Any sport that requires running has the risk of ankle injuries. A sprained ankle is one of the most common tennis injuries. Even the greats like Roger Federer and Andrew Murray have suffered sprained ankles. With any sport, proper training and condition is crucial to injury prevention. This means warming up before a match as well as maintaining your fitness even in the offseason. Tennis is a fast paced sport that requires not just muscle strength but also endurance. You need to be able to sprint back and forth, backwards and forwards, throughout the match. When strength training, focus on the shoulder muscles to help prevent rotator cuff injuries. Strengthen and stretch the wrist and forearm muscles to prevent tennis elbow, as these tend to absorb the most impact from the ball hitting your racket. Work on your core and back to further reduce the chance of injury. For tennis, technique is extremely important not just to win but also to extend your career by reducing the risk of injury. Make sure you have the proper form for each type of swing. That said; try not to repeat the same swing too many times in a row. Mixing it up helps prevent overuse injuries but is also more in line with how a match will be played. In addition, make sure you have the right equipment. Pay attention to the grip size of your racket. Make sure your footwear is supportive. If you are experiencing even minor pain, consider taping the area or wearing a brace for added support. A mere glance at the sports section of the newspaper reveals the wide array of injuries that plague athletes as they participate in what they do best. Articles written by sports experts project how injuries will affect playoff chances and speculate as to whose career may be coming to a close due to an injury of one sort or another. In order to perform at their best, athletes should be concerned with keeping their bodies healthy as they are about regular training. Wearing sports braces is important for athletes because they keep our joints moving naturally. They help to prevent injury and also provide added support and stabilization for individuals who have sustained previous injury. In fact, many professional athletes wear braces for sports to help protect their body from season-ending injuries. Joint protection using sports braces is just as important for recreational athletes as it is for professional athletes. Even non-contact sports can put you at risk for injury, especially if it involves running. Did you also know that there’s a risk of injury for these activities too? Remember to wear braces for sports when you participate in physical activity, so you can stay healthy and keep doing what you love. With the NBA set to return on Christmas day, sports injury specialists are wondering if the lockout will lead to an increased number of player injuries. While many players probably remained diligent during this extended off-season, it’s very likely that some did not stay consistent in their conditioning. Join recreational sports leagues to stay in shape. Bringing a friend will make it even more fun! Go to the gym regularly and continue working out. Again, bring a friend for accountability. Wear knee braces, ankle braces, elbow braces, etc. – give your joints extra support depending on what’s appropriate for your sport. Not only can these tips help you perform at your best when it counts, but they may help you stay healthier too! Derek Jeter has won five World Series and is almost certain to go to the Hall of Fame. Earlier this week he stood poised to slam his 3,000th hit in Monday’s game against the Cleveland Indians. Instead he limped off the field due to a sore right calf in the 5th inning, and the Yankees lost the game 1-0. Have you ever been held back from achieving your best due to a sports injury? Injuries are very common for people involved with athletics. Running at high speeds, lateral movement, repetitive motion and impact with other people or the ground can cause strain on our muscles, ligaments and bones. Sometimes sports injuries are beyond our control, especially for high-caliber athletes that put strain on their bodies every day. However, you can help prevent joint damage or protect your body from further injury by wearing a brace for that specific injury. Check out our braces and supports for common injuries and keep achieving your best!